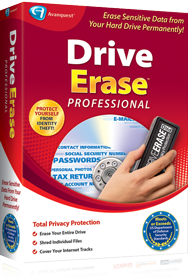 Permanently erases all of the data on your hard disk - or just the files you select. Meets or exceeds US Department of Defense security standards for secure file erase software. Ideal for restoring a system after a virus or spyware damage. Create a boot CD for 100% hard disk erasing. Choose from seven data destruction options. Compatible with all Windows drives - IDE, SCSI, USB, FireWire and more. Disk Viewer utility shows proof that data has been deleted securely and permanently.